Gujarat government’s claim that its social sector expenditure has been on a radical upswing – an urgent requirement considering the state’s known poor performance in health, education, water resources and poverty alleviation – appears to have gone phut. 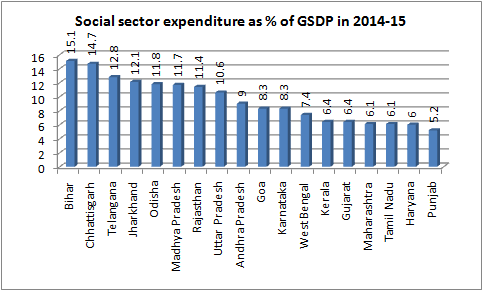 If the latest Reserve Bank of India (RBI) document “State Finances: A Study of Budgets 2014-15”, is any guide, Gujarat ranks 14th among 18 non-special category states in spending funds for the social sector, despite a high rate of growth. Measured as proportion to Gross State Domestic Product (GSDP), the state’s social sector expenditure in 2014-15 was 6.4 per cent of the GSDP in the financial year 2014-15, RBI data show. As per cent of GSDP, the poorer states have performed much better, suggests RBI, with Bihar topping the list with 15.1 per cent of the GSDP, followed closely by Chhattisgarh (14.7 per cent). On the other hand, “richer” states, following Gujarat, have equally formed poorly -- Maharashtra speding 6.1 per cent of GSDP, Tamil Nadu 6.1 per cent, Haryana 6 per cent and Punjab 5.2 per cent. Economists consider calculating social sector expenditure as percentage of GSDP an imporatant indictor suggesting whether the benefits of economic growth are being passed on to the socially and economically disadvantaged sections of population. 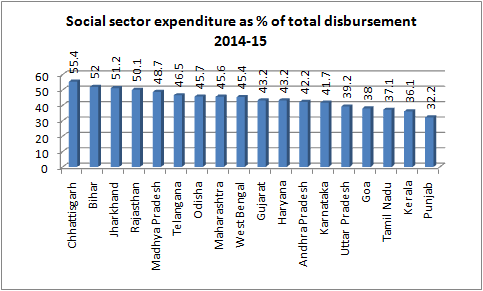 In yet another measurement – social sector expenditure as per cent of total budgetary spending – again Gujarat is found to be performing worse than nine other states, ranking No 10th. While Gujarat’s social sector spending was 43.2 per cent of the budget, RBI data suggest, the best performing state was Chhattisgarh with 55.4 per cent, followed by Bihar (52 per cent) and Jharkhand (51.2 per cent). A further insight into the social sector shows that Gujarat’s lag vis-à-vis other states is mainly in the field of education. Despite the much-publicized Kanya Kelavni drive to enroll children, especially girls, in primary schools, Gujarat spent 15.8 per cent of its budget on education in 2014-15. RBI data show, this was the worse than nine other states. 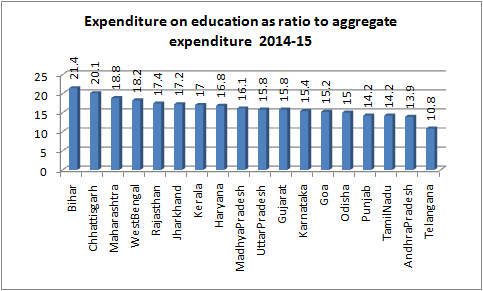 Here again, Bihar, spending 21.4 per cent of the budget on education, tops, followed by Chhattisgarh (20.1 per cent) and Maharashtra (18.8 per cent). RBI data, however, show that Gujarat’s ranks much better on spending on healthcare with 5.4 per cent of the total budgetary spending, which is worse than only three states – Rajasthan (6.6 per cent), Kerala (5.5 per cent) and Goa (5.5 per cent). 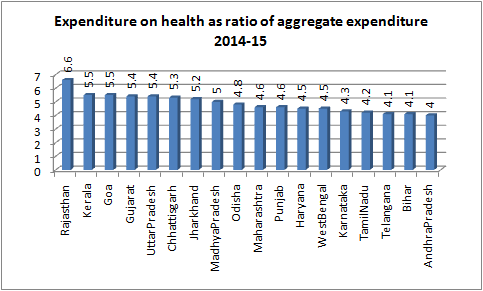 On healthcare spending, Bihar performs very poorly with just about 4.1 per cent of the budget. The worst performer on this score is Andhra Pradesh (4 per cent of the budget). The data, released in May second week, come against the backdrop of Gujarat government claim that it had set aside a bigger amount, 48 per cent of the annual plan for 2015-16, for the social sector. However, experts say, the proof of pudding is in eating – it is difficult to say whether the state government will be able to spend the amount it has allocated for the social sector. State finance minister Saurabh Patel, presenting the budget in February-end 2015, had claimed that he had “allocated” more on health, education, women and child development and malnutrition, adding, for the first time, the state has introduced gender-based budgeting, with many of its new schemes directed at upliftment of girls and women. This was done because Gujarat a woman chief minister, he insisted.